We've had many enthusiastic civil servants volunteer to support Brandon Trust with their social enterprise allotment this year. One recent volunteer shares their story. “After contacting CS Local to enquire about volunteering opportunities to get involved in, a date was set for 7 June for a group of 15 volunteers from Treasury Legal Advisers to attend the Brandon Trust Allotment Project in South London. The project provides a safe space for adults with learning disabilities and autism to experience nature, exercise and socialise with volunteers. The weather was perfect for a day of volunteering outdoors with a mixture of sunshine and clouds, and warm but not too warm! We arrived for a 10am start to a very peaceful allotment, a lovely change from our busy office environment, and were greeted by Dawn who works for the Brandon Trust. We had an opportunity to explore the allotment which featured plenty of vegetable patches, beautiful flower beds and even some chickens before Dawn showed us the two plots belonging to the Brandon Trust. After kitting ourselves out with supplies from the garden shed, we set to weeding, planting, watering vegetable patches, cutting grass and painting raised flower beds. During this time we met and worked with those Brandon Trust supports who had come to help on the allotment for the day. Approaching lunchtime we stopped to light a BBQ and set up parasols and picnic benches. 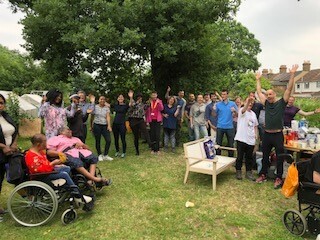 The BBQ was a “bring and share” event and had a community atmosphere as volunteers from Treasury Legal Advisers and Brandon Trust employees and clients ate together. It was a great opportunity to learn more about the brilliant work that the Brandon Trust does and how it supports those with learning disabilities. After the BBQ we set to perhaps the most challenging and technical task of the day, lifting the entire frame of a greenhouse over a fence and moving it across the allotment to its new home before replacing its panes of glass. Once we got the hang of pinning in the glass our work moved to a swift conclusion. We stepped back to admire all that had been accomplished in the course of the day and headed home for a well-deserved rest. Sincere thanks go to the Brandon Trust for letting us volunteer with them and CS Local for organising such an enjoyable and worthwhile day”. Want to get involved: There are more opportunities with Brandon Trust coming up. When: 5 July, 30 August, 27 September, 25 October, 22 November.Up to 20 volunteers for each day – you can volunteer for one or more days and as a group or an individual. Interested? Contact us stating date and location to express an interest or for further details, groups up to 20 volunteers welcome.